There is an urgent need to understand factors that lead to patient’s experiences of success or failure for all temporomandibular disorders (TMD) treatments, especially those that are irreversible such as temporomandibular joint implants, and to incorporate this information into educational and training initiatives for health care professionals, and inform regulatory decision-making. The current state of TMD treatment is only supported by sparse evidence on the safety and effectiveness of any single approach, with little data available on comparative effectiveness or safety for different therapies, and even less data on patient experience and outcomes past the perioperative period. These data are just as necessary to guide health care providers and patients in making informed treatment decisions, as they have been repeatedly shown to be in other medical disciplines. Desperate patients in severe chronic pain are treated by empathetic, well-meaning medical professionals, who have only sparse, mostly anecdotal evidence to rely upon. Thus, trial-and-error is the typical approach in treating TMD patients and the outcomes of this approach are less than satisfactory. As a result, some patients develop serious comorbidities including worsened chronic pain, facial paralysis, disfigurement, infection, device migration within the skull, reduced jaw mobility, increased opioid use and dependence, increased suicidality, and other serious adverse events. The outcomes of this project will ultimately inform development of scientifically-robust, comprehensive treatment guidelines to enhance outcomes of TMD treatments based upon knowledge of a patient’s overall phenotype, disease progression, and treatment trajectory to improve the lives of patients suffering from TMD. Develop a standardized data infrastructure for capturing patient-generated data, physician experience, and other healthcare ecosystem data necessary to better understand the disparate treatment pathways and outcomes that patients experience. Affect a change in clinical trial practice to incorporate patient preference and real-world experience into FDA-regulated and public health trials, beginning with medical devices as a stepping stone to all treatments for TMD. Make the patient-reported outcomes, preferences, and other scientifically-robust patient-centered data available for inclusion in future clinical trials and surveillance efforts for all TMD treatments. Provide a roadmap for the development of precision medicine algorithms that predict individual outcomes from TMJ therapies. Phase 1: evaluate current therapies and outcomes. Phase 2: provide guidance and pilot algorithms that best predict individual outcomes. Develop evidence-based protocols, guidelines and best practices for inclusion in professional health care curriculum. Promote the development of collaborative and individual research projects, by governmental and non-governmental stakeholders that incorporate the needs and concerns of patients. 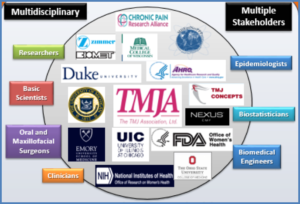 Working Group 1: To explore the multidisciplinary intersection of patient biology, anatomy, genetics, and physiology with TMJ medical devices and clinical patient-centered outcomes to better target therapies toward patients who are most likely to benefit from them. Working Group 2: To evaluate outcome assessment and reporting tools based on patient input, and to develop evidence to incorporate patient-centered data into clinical care. Working Group 3: To develop evidence-based best practices, treatment protocols and clinical practice guidelines which will include patient-centered data. Working Group 4: The results of this exercise will set the stage for the fulfillment of the RoundTable goal: to develop evidence based best practices, treatment protocols and clinical practice guidelines which will include patient-centered data. For more information, please contact the Co-Chairs of the TMJ Association, Terrie Cowley (tcowley@tmj.org) and Dr. Danica Marinac-Dabic (Danica.Marinac-Dabic@fda.hhs.gov).